While integrating more and more “green” practices into my daily life, I discovered that a tiny country linking the two Americas is leading the way in their commitment to healing the planet. This small nation is one of the top 20 richest countries in the world in terms of diversity of species and biodiversity. Costa Rica, home to hundreds of plants and animals, tropical rainforests, volcanoes and a dozen eco-systems set between Caribbean Sea and the Pacific Ocean, takes the commitment to preserve their gifts of nature very seriously. On my recent visit to Costa Rica, I not only enjoyed the beauty of the Selva Verde eco-lodge and all the activities which it offers, but I had the good fortune of meeting the owner and founder of Selva Verde, a fascinating “green” pioneer, Italian-born Giovanna Holbrook. I learned that in 1974, following years of extensive travel, she founded her own tour operation and travel agency specializing in educational trips for people who shared the ideals of conservation and respect of nature. Eight years later, after organizing a trip to Costa Rica for an ornithological field study at La Selva, a biological station in the Sarapiqui region, she discovered that the owner of a large forest area in that region was selling his property of old growth forest. Holbrook managed to pull together the money and contacts to save the 500 acres of tropical forest and to create a facility that could host groups of naturalists. Her dream grew into what is now Selva Verde, a special place where visitors discover and nurture a love and concern for nature and all it has to offer. Selva Verde continues to lure nature lovers from all over the world and provides a paradise for birders including a bird watching walk with a resident naturalist guide each morning. This is where my eco-discovery began. The lodge also offers a bird identification guide for guests which pictures and names more than 50 different species out of the more than 500 that inhabit the country. I enjoyed identifying many of the brightly colored creatures that regularly gathered on platforms throughout the area pecking away at the plantains provided daily. Throughout my trip I spotted toucans, great green and scarlet Macaws, Neotropic Cormorants golden-hooded tanagers and great kiskadees to name a few. 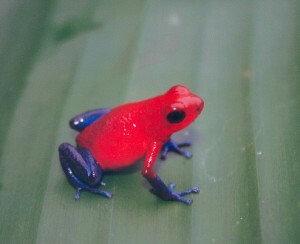 One afternoon, walking through the self guided jungle trails, I looked out for tiny poisonous red frogs with blue legs known as the blue jeans frog. When the path turned alongside a creek, I spotted a prehistoric looking iguana and several crabs and I was told that this is a place where caymans (alligator) may often be found. A variety of birds and brightly colored butterflies flitted by. Thirty posted areas of interest called my attention to a variety of trees and plants as I continued along the trail stopping to see what other guests had discovered along the way including a tiny, pretty, bright green and black poison dart frog. I was happy to be outfitted in high rubber boots and my favorite insect repellent wardrobe from Buzz Off as I trekked along through the exotic foliage and towering trees. Wandering through the covered walkways through Selva Verde, I came across the Sarapiqui Conservation Learning Center, a non-profit organization offering educational programs geared toward community development and environmental conservation through exchanges with locals. 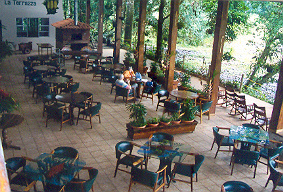 Guests at the lodge may participate in a variety of activities presented by the center including a cooking class offering an opportunity to learn how to make traditional Costa Rican dishes; Artisania classes where participants are instructed in new art skills, Latin dance classes, home/farm/school visits and most important, several classes on the topic of environmental education and service learning. For only $12, visitors may spend a day as tropical field ecologists assisting the staff and community members with the Center’s ongoing conservation monitoring projects. They are given the opportunity to do something really worthwhile in learning to collect and analyze field data though hands-on activities providing valuable data to the Center and community. Next on my agenda was a contemplative hike through an ancient rainforest. The Sarapaqui River picturesquely runs directly in front of the lodge’s indoor/outdoor public space where guests gather for meals and cocktails and just relaxing. Stretched across the river, a green swinging bridge, which actually does not move very much during a crossing, connects the property with an ancient primary rainforest. It was there that I spent a most informative couple of hours with my guide, Abelardo, a well-informed, self-educated young Costa Rican man with sharp eyes that did not miss a thing. He explained in depth about the flora and fauna of this very special place as we hiked up and down the muddy trails winding through the rainforest while spotting a variety of birds singing their lovely songs. One of the high points of the exploration was viewing the ancient Almond Tree, which provides a habitat for the imperiled Great Green Macaw. 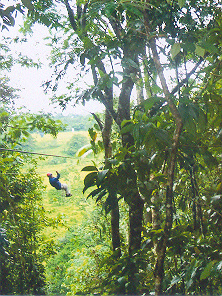 After all the tranquility, I was ready for some excitement, so I headed over to La Linda Canopy Tour for my first zip-line canopy tour adventure. I was outfitted in a helmet and harness and felt relieved that my two young guides obviously knew what they were doing and were very safety conscious. With some trepidation, I flew across the first of 14 zip-lines more fearful of the landing than anything else. But all went well. After that, I screamed for joy as I zipped along through the tropical rainforest and over the raging Sarapiqui River, sent off by one guide and caught at the far end by the other. 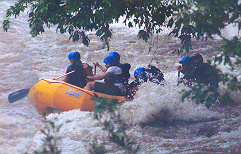 White water rafting provided another day of excitement on 3+ rapids. After outfitting our group of four in helmetsand life jackets and providing a brief rafting lesson, we were off on the river with our excellent guide in our bright yellow rubber raft with a safety kayaker leading the way through the oncoming rapids. Each time we successfully navigated a stretch of particularly awesome white water, we did a high five with paddles to congratulate ourselves. All of us agreed this adventure was one of the highlights of our visit. On another river-based experience, I enjoyed a Sarapiqui Wildlife Boat ride through calmer waters to view birds, iguanas, tiny bats vertically lined up on a tree trunk and monkeys. I learned that there are many more creatures in the area, but on my cruise, they were playing hard to get. I did, however, enjoy chatting with a young German couple with whom I shared my boating experience spotting hidden animals, birds and reptiles. On my final day at Selva Verde, I ventured over to a cacao plantation to learn the history and preparation of one of my favorite foods— chocolate. I fell in with an English-speaking group who were visiting from Holland. We were led across a great green 850 foot long swinging bridge crossing the Sarapaqui River rapids followed by a ½ hour canopy walk to a rustic roof covered area with basic bench seating fronted by a long table. There we learned the very interesting history of the discovery and development of chocolate presented in a light-hearted manner by our knowledgeable guide. We sampled the raw products, saw how they were refined and tasted the mouth-watering outcome before heading back to Selva Verde. 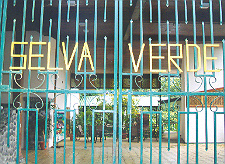 My diverse visit to Selva Verde offered a very special and memorable experience. Walks through virtually untouched primary jungles, home to hundreds of species of wildlife, the unique learning center, my adventures on and above the Sarapaqui River, chocolate education and most of all Giovanna Holbrook’s dedication to conservation will remain a special place in my heart. Buzz Off Insect Shield Repellent Apparel – aids in insect protection not only for travelers but the company welcomes opportunities to assist agencies and international relief organizations that work to protect at-risk populations from insect-borne diseases. Their products bond a man-made version of a natural repellent to fabric fibers so that garments retain effective repellency through 70 launderings. The lightweight, fast-drying wardrobe which I assembled kept me bite-free and comfortable without the unwelcome need to apply strong insect repellents directly to my skin. Holbrook Travel — provided a comprehensive packing list which made preparation for my visit much more efficient. Some of the items I found most useful were sunscreen, a flashlight, camera, comfortable walking shoes and several items from lightweight clothing lines which incorporate Buzz Off Insect Shield.